OWC Mercury On-The-Go USB 3.0 & 2.0 Storage Solution. The OWC Mercury On-The-Go USB 3.0 & 2.0 Storage Solution provides maximum storage in an ultra-portable, totally bus powered design! 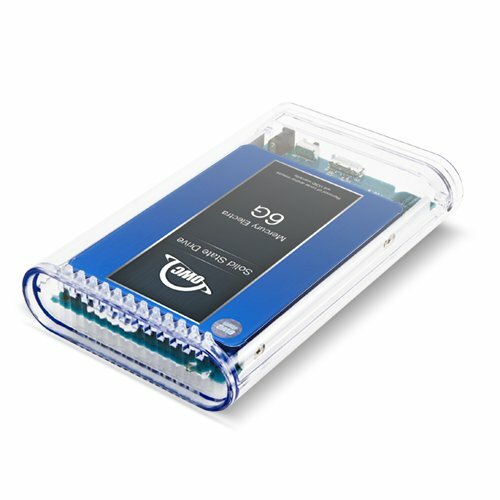 Stylishly engineered in a sleek, impact-resistant acrylic enclosure, the Mercury On-The-Go Pro incorporates shock-isolation technology to give maximum protection for your precious data inside. The Mercury On-The-Go Pro is a true must-have for users like you who are seeking High-Performance and Highly Reliable storage weighing less than 11 ounces and that is small enough to fit in your pocket. If you're looking for one of the most compatible mass storage solutions made, look no further! The OWC Mercury On-The-Go drive is all you'll need! The OWC Mercury On-The-Go has what it takes to truly work cross platform. The Mercury On-The-Go Pro is bus-powered, so it doesn't require an AC adapter! The OWC Mercury On-The-Go's fanless design offers near silent operation while still keeping your drive cool. The built-in aluminum heatsink underneath the drive and pass-through cooling vents on the top of the case work in tandem to provide optimum results. The OWC Mercury On-The-Go can be used with any Macintosh or PC with a USB 3.0 & 2.0 port. Now you can have SuperSpeed performance up to 500MB/s and compatibility with legacy machines! Includes: OWC Mercury On-The-Go Pro USB 3.0 & 2.0 storage solution, High Quality Double Shielded USB 3.0 & 2.0 certified connecting cable, Carrying Case, Pre-installed Backup and Utility software, Over 1.5GB of Freeware/Shareware/Public domain software pre-installed.